Try the new Chicken Fried Chicken Melts! We’ve added a new level of flavor to our classic Chicken Fried Chicken. 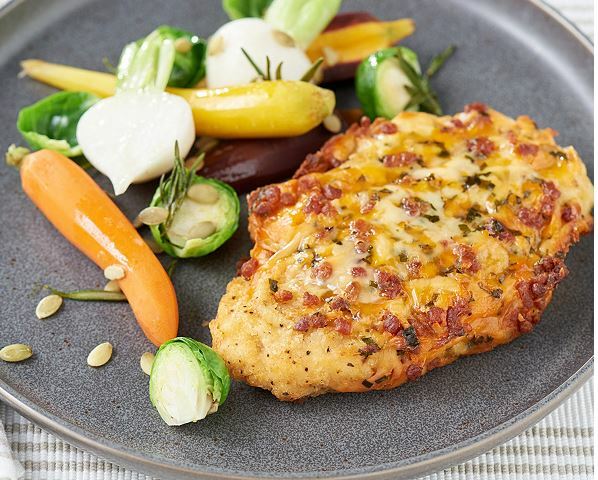 Each generously sized breaded chicken breast has been topped with 2 ounces of either bacon & three cheeses or jalapenos and cream cheese to give it an extra flavor punch. Conventional Oven: Preheat oven to 375 F. Remove desired number of pieces from packaging. Place chicken with cheese side up on a sheet pan lined with parchment or sprayed with non-stick cooking spray. Bake for 25-35 minutes, or until the internal temperature reaches 165F using a meat thermometer. Cheese will be melted and bubbly, and chicken will be crispy. Remove from oven, rest 3 minutes before serving. Air Fryer: Remove desired number of pieces and place chicken in air fryer, cheese side up. Do not stack. Cook at 330F for 18-20 minutes or until internal temperature reaches 165F and cheese is melted and bubbly.